When the weather heats up outside I crave simple meals and light refreshing snacks. But my summer cravings are only half food related; the other half are clothing related. My hot weather wardrobe needs to be lighter in both texture & color. Even though dark shirts and long skirts are adorable they aren't conducive to 100+ degree weather. Together Stonyfield and prAna make it easy to satisfy both of my summer cravings. Recipes featuring yogurt like: fresh fruit & yogurt pops and yogurt covered frozen bananas are a delicious way to stay cool throughout the summer, along with clothing options from prAna's summer collection. 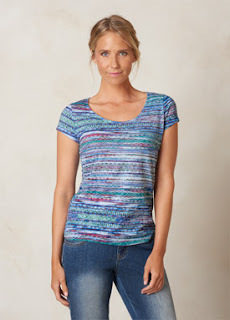 The prAna Garland top is the perfect example, it offers a lightweight fabric and beautiful summer colors. This is quickly becoming my new go-to shirt for weekends. Head over now and take a look around I'm sure you will find something to satisfy your #summercravings! My summer craving is watermelon! My summer cravings always tend to be frozen yogurt, margaritas by the beach, and lemonade! Thank you! Follow on IG! My summer cravings are blueberry jam, iced green tea, and homemade peach coconut ice cream. I love red ripe juicy tomatoes!! My summer cravings are all the fresh fruits available - melons, berries, stone fruits and much more. My #summercravings are frozen custard & strawberry shortcake! I crave strawberries and peaches in the summer. Summer cravings: strawberries, asparagus, ice cream. My summer cravings are strawberries and watermelon! I crave watermelon all year long, but more so in summer. So good. I also dig cherry season. I love the fruit available in the summer and peaches, plums and nectarines would be my #summercravings. I follow on Instagram as orchidlady01. I crave ice cream in the summer. I just started looking at their clothes and I think they're so pretty! I'll have to shop around on their site some more! My summer craving is cold ice tea! Right now my craving is lemon slushies! Love the top! Pretty and comfy. My summer cravings are fruit and air conditioning! My summer cravings are avocados and blueberries! My summer craving is fresh tomatoes from the garden. I'm craving strawberries and cream! i'm craving fresh fruits and skiing! My summer craving? FRESH fruits and veggies from our farmers markets. I am in Toronto, and we wait a very long time for fresh local produce.. Still not srawberry season here...soon!!! I love to have fresh fruit smoothies in the summer with an assortment of fruits. I crave mojitos. Lots and lots of mojitos in various summer flavors like strawberries, blueberry, and watermelon. I'm with you on the lighter foods AND clothing! Thank you for the offer....and the scrumptious recipes that we all crave. Fresh cold green salad with strawberries.